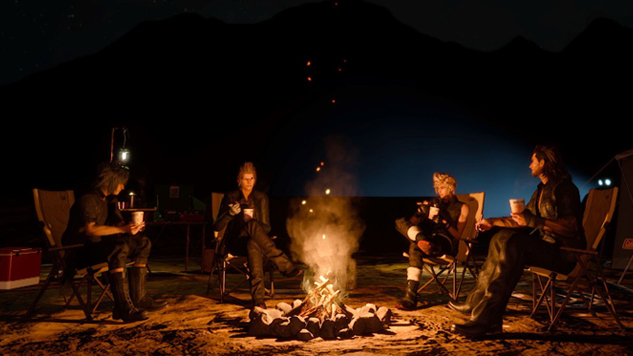 Still cravin’ the delectable, high-def eats from Final Fantasy XV? Then have we got the recipes for you. 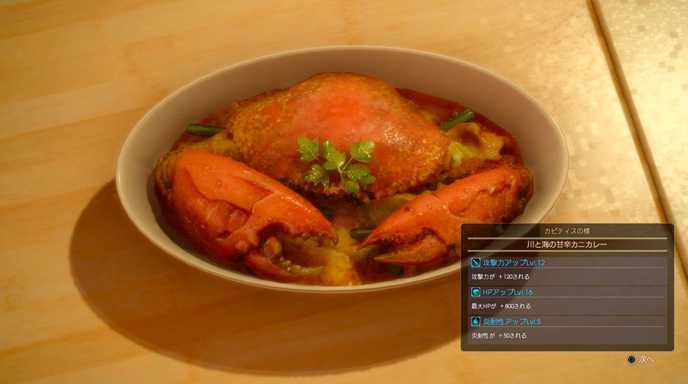 This week, it’s another installment in “The Food of Final Fantasy XV”, and this time the dishes hail from opposite sides of the world, with a crab curry from southeast Asian and a fancy sandwich from the cafes of France. If you missed it, check out the salmon teriyaki and chicken cutlet from last week! You wouldn’t know it from the menu at a typical American Indian restaurant but the sub Indian continent has literally dozens of regional cuisine styles, many of which are coastal and feature a lot of seafood. Perhaps the best curries in the world come from Sri Lanka, where the influences from many styles ranging India to southeast Asia all come together to create a salty, spicy, sweet, floral, aromatic heaven. Today we are cooking Sweet Saltwater Crustacean Curry, a restaurant dish in Final Fantasy XV that, based on appearance (the yellow, possibly tumeric-heavy sauce, what appears to be pieces of lemongrass, and a garnish of coriander leaf) is probably a Sri Lankan style curry. In the picture you can see a full crab with the shell intact, sitting in a pool of curry sauce, which in reality would be a very poor way to serve crab curry. While some curries feature whole-body crab, the top shell is usually removed and the body halved, with the claws either torn off or left as-is during steaming. A crab with the top shell still intact has guts and gills remaining under the hood, so definitely do not serve yours in this fashion. You can either dish it up traditionally, which is to remove and throw away the shell, then cut in half and simmer in a pool of sauce with the claws, or you can use frozen crab or lobster claws. As for the type of crab you should use for this dish, the picture shows what looks like a Dungeness crab. But you can use any local seawater crab (for example, East coast folks, you may prefer Maryland blue). For this recipe, 2 crabs (about 1.5-2 lb each) should probably be enough, with 1/2 a crab per person. Personally I’m not a huge fan of eating whole-crab curry (it’s very messy), so if you prefer to use loose crab meat, that’s fine. Just make sure you add the meat at the absolute final stage of cooking the curry sauce, and stir as infrequently as possible, because crab meat shreds very easily. You may wish to use snow crab surimi, which is cheaper and holds better shape, instead. A few notes on the spices: If overcooked, both mustard seed and fenugreek seeds can become inedible and bitter. Make sure to cook the mustard seed only as long as it needs to pop, then diffuse the heat by quickly adding other ingredients and stirring. If, after you’ve finished the curry sauce, any bitterness remains, you can add a little more ground coriander or demerara sugar to offset. Lime juice can be used as well. Be sure to add all ingredients in 1/4 tsp increments and taste the sauce between additions to balance saltiness, sweetness, sourness, and spiciness. For this recipe I used Aunt Patty’s Tamarind Paste, which really has more the consistency of a syrup. It’s mostly used to act as a souring agent, so if you cannot find actual tamarind paste, use lemon or lime juice. Be sure to add in very small increments if you’re using a substitution, just in case. Lime leaves can be found in the fresh herbs of most grocery store produce sections. If you cannot get fresh pandanus leaf (usually found in Asian markets, frozen if they do not have it fresh), you can buy it fresh or dried from Amazon (use about 10-15 small strips if using dried). This is where I also buy my fresh and dried curry leaves. Store the fresh stuff in the freezer to retain its full flavor over time. Dememara sugar has light amber colored grains, and is used largely in Indian cooking. If you cannot find it, light brown sugar or any mild, molasses-imbued sugar will do. Begin by placing shallot, garlic, ginger, paprika, cayenne, and salt in a food processor and blending into a thick paste. Next moisten a large wok with vegetable oil and heat on medium high. Add the mustard seeds, peppercorn, lemon grass, pandanus leaf, and cinnamon and stir lightly. Once the mustard seeds begin to pop, add the fenugreek. Stir a few times more, then add the shallot paste. Stir fry until it has slightly reduced, about five minutes, then whisk in the coconut milk until smooth. Bring to a simmer. Once the mixture is slightly boiling, add salt, fresh ground coriander, paprika, turmeric, and tamarind. Taste, add demerara sugar if necessary, then add the diced tomatoes. Next add the crab. If using shelled crab, the parts need about 10 minutes to simmer in the curry sauce to warm all the way through. Garnish them with the lime leaves and cover the wok with a tight fitting lid and allow to simmer. Check and stir about halfway through, tasting the sauce as it “blooms”. Add ground coriander, salt (or even Thai fish sauce), or lime juice as needed. Once the crab is heated, you can serve in large bowls with a few inches of curry sauce on the bottom, and grab a crab or nutcracker and a roll of paper towels, because it’s about to get messy! Unless you used loose crab meat in which case, there will be substantially less clothes-staining splatter. If this recipe is not hot enough for you, feel free to add a few Thai chili peppers to the garlic, shallot, and ginger paste. You can also fry a few Thai chili peppers or dried red chili peppers in the oil before adding the paste. If you have them, fresh or dried curry leaves are also a nice and tasty garnish. Serve this meal with my favorite side dish, from Madhur Jaffrey’s Ultimate Curry Bible (aka the best book in the world): saffron and cardamom Jasmine rice. First take 1 tsp of saffron threads and place them between two sheets of aluminum foil, then use a rolling pin to crush into small pieces. Then put 1/4 cup of very heavy cream into a mug and heat in the microwave for 30 seconds. Add the saffron, 1/4 teaspoon ground cardamom and 1/4 tsp of sugar, stir, cover, and set aside for at least 3 hours. Once you’re ready to make the rice, heat 2 tablespoons of vegetable oil in a 6 quart pot on medium heat, then add two cinnamon sticks and cover. Once the cinnamon sticks have unfurled, add 2 cups of Jasmine rice, and fry until the rice is slightly translucent. Add three cups of hot water and 1 tsp of salt, bring to a high boil, cover, then reduce the heat to low. Let cook for 25 minutes or until all the water has been absorbed, stirring once halfway through the process. Once it is fluffy and ready to eat, drizzle with saffron cream mixture and stir and distribute throughout.